We have such a snowy winter that I really miss the summer and green colors. 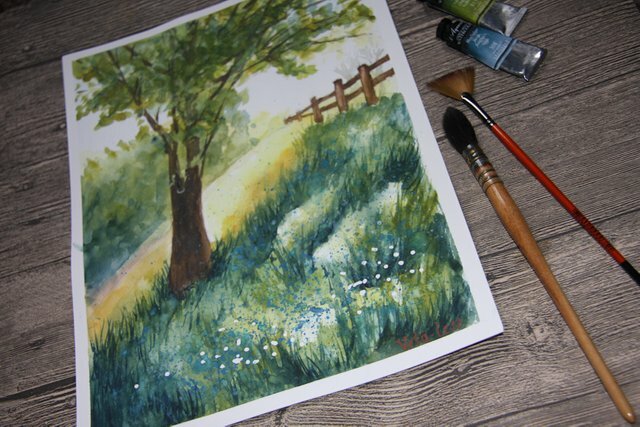 So I chose for the next watercolor painting online lesson from artist Julia Stepashkina with green forest. First, I drew a sketch. It's easy-horizon line, fence, silhouette of a tree. Then sprinkled masking liquid on the places where there will be grass and white flowers. Now I take watercolors. For my painting I chose yellow and green colors, as well as indigo for shading green. I started with yellow, and then I started applying green. Yes, I forgot to write that I was painting on wet paper. Here I added more dark green and blue shades. 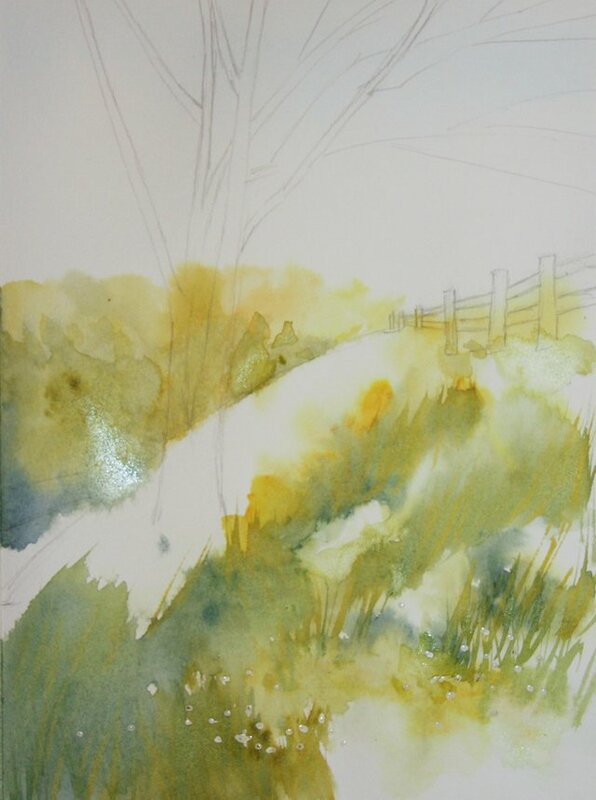 The last stages-to draw a trunk and branches of a tree, and also to spray white and blue spots on a grass. These spots are small flowers. I also tried to draw this digital picture. I'm still learning and trying to remember and choose the brushes that fit me. The digital image is smoother. I liked to draw the leaves of the trees, as I used a special texture brush. I also used a textured grass brush in some places. Digital painting took me less time than watercolor. 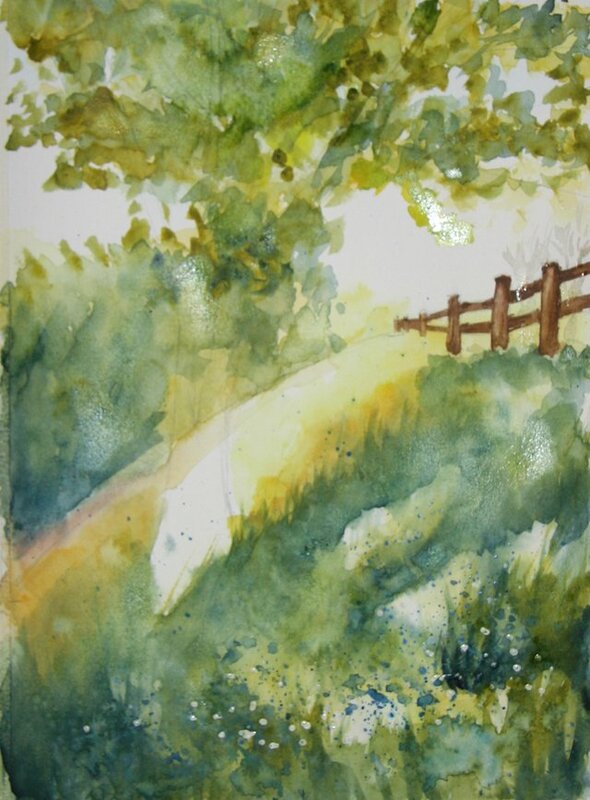 But in the watercolor painting I put more time and effort, and I was comfortable to mix colors and get new colors. In digital painting, I still do not understand how to get new colors. What I can definitely say.. the composition is just perfect! Your digital painting skills are progressing so quickly Veta. You are achieving the effect of transparent layers really well. I think after working with watercolour you would have an excellent feel for how to build up your layers ~ Just that the medium is different now. Oh, I am now drawing a digital picture with layers. I need to discipline myself, because I forget to follow that on which layer I drew ... and begin to draw on the wrong layer)))) But digital painting is easier, that there is no need to monitor the moisture of the paper and dry it, and also easier сorrect mistakes. 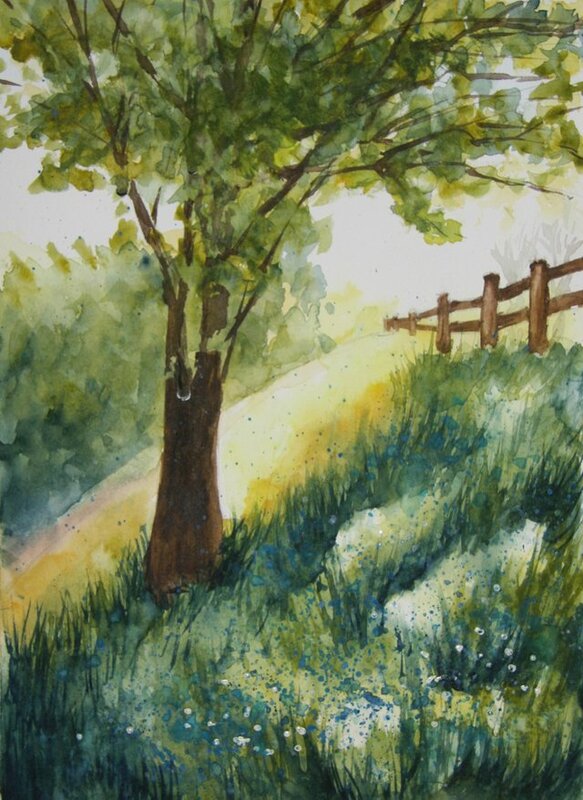 Beautiful vivid watercolour painting, nice composition too! Digital version looks nice too, it can be tricky sometimes especially when trying to achieve the same results of a traditional painting. I Think Paint tool Sai has some cool blending effects that allow it to behave more like a watercolour or traditional painting. 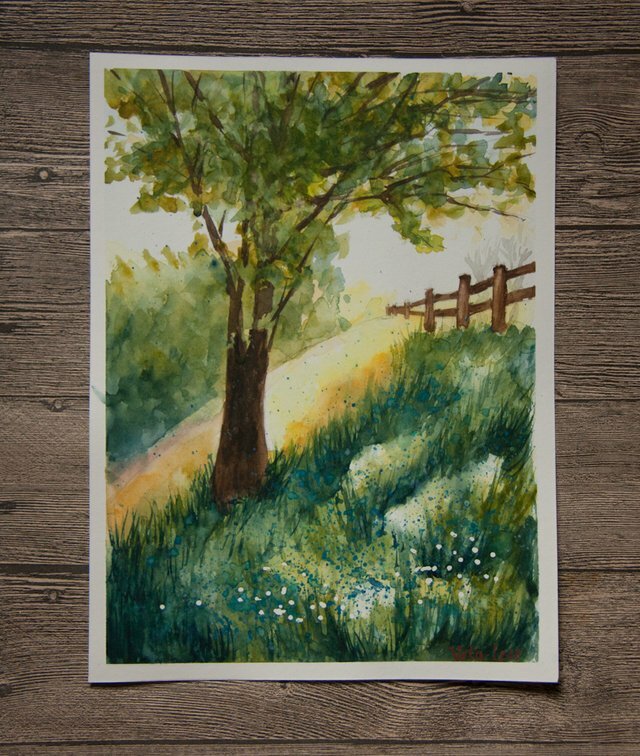 Lovely water colour painting @veta-less looks vibrant, you obviously looking forward to Spring. Акварельная мне тоже нравится больше, чем диджитал. Мне кажется, это от более светлых тонов такой эффект "недоработанности". А я уже не знаю, что мне нравится больше) когда долго смотрю на свои рисунки, то они приедаются...) Да, цифровая какая-то слишком гладкая...может надо было добавить потемнее цвета и какие нибудь текстуры, чтобы было поинтереснее. What an awesome painting, Veta! Beautiful work! Congratulations! This post has been upvoted from the communal account, @minnowsupport, by Veta-less from the Minnow Support Project. It's a witness project run by aggroed, ausbitbank, teamsteem, someguy123, neoxian, followbtcnews, and netuoso. The goal is to help Steemit grow by supporting Minnows. Please find us at the Peace, Abundance, and Liberty Network (PALnet) Discord Channel. It's a completely public and open space to all members of the Steemit community who voluntarily choose to be there. I'm pretty bad at watercolour paintings so I guess I won't have much to say apart from "it looks beautiful"...the blending of colours are great, simple and vivid. I also never knew that masking liquid is a thing, so a TIL for me! If you are drawing with Photoshop, Krita, or any other professional drawing software (with a great professional drawing tablet like those expensive Wacom stuff), you should be able to recreate the same thing with similar effort :) It might be tricky to get used to the brushes but if your tablet has support for tilt and pressure detection it should be intuitive. And regarding colours...here's a hack. If you prefer mixing them the traditional way, then do it the traditional way and use a colour picker...just splat them on a spot of the canvas and pick the colour that you want later 😂 looks like a very weird method but it should work! Hello dear Veta-less, I like your new watercolor painting. It is very beautiful, I think that seeing the trees with all those green leaves is incredible, can be under them and feel the free breeze through the body. You're welcome, honey! It is a pleasure!. The green leaves will come, in a short time.... Where I live, I do not have snow, it's always the same. We've had a few teases of spring here, but I still enjoy seeing your rendition of it on paper to get me really excited for it to come in full effect! I love the blues in the grassy area. You make me really enjoy watercolor. I've seen more tattoos lately in a watercolor style, so perhaps I need to keep it in mind for my next piece of body art. With your skill on paper, I'm sure you'll improve on the digital end in no time! Howdy veta-less! in the last comment on your other post I just said I can't wait to see artwork from the digital art machine and here it is! lol. 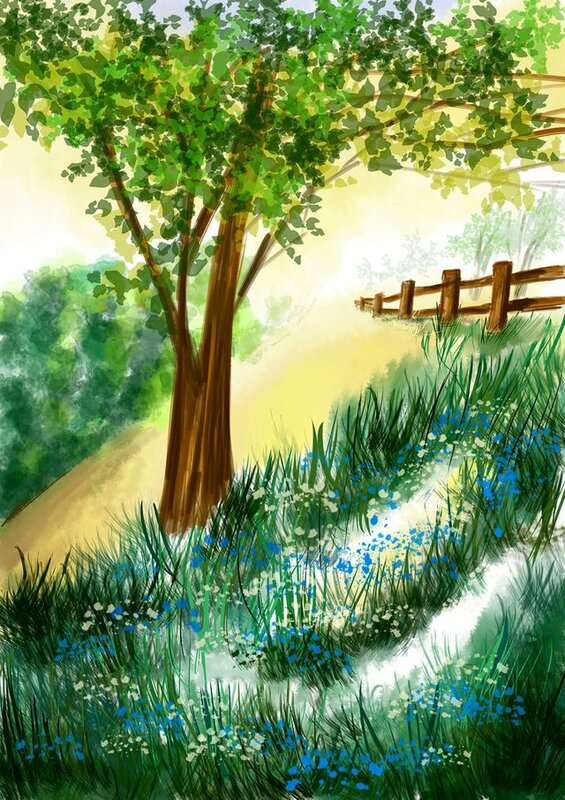 very good, especially for just learning still and the brush painted picture is wonderful, very rich colors and such a warm summer feel to it so well done! Howdy today veta-less! well you are very welcome and you deserve compliments to your art because it is very good and it will be wonderful to see your future paintings whether they are actual water colors or digital ones! Always impressed, when someone masters the art of watercolor to higher degree, as for me it is one of the most difficult media if done right. Your digital is nice too, but I still prefer the traditional, with its warmer tones and lighter feel. Thank you for the kind words Reinhard! 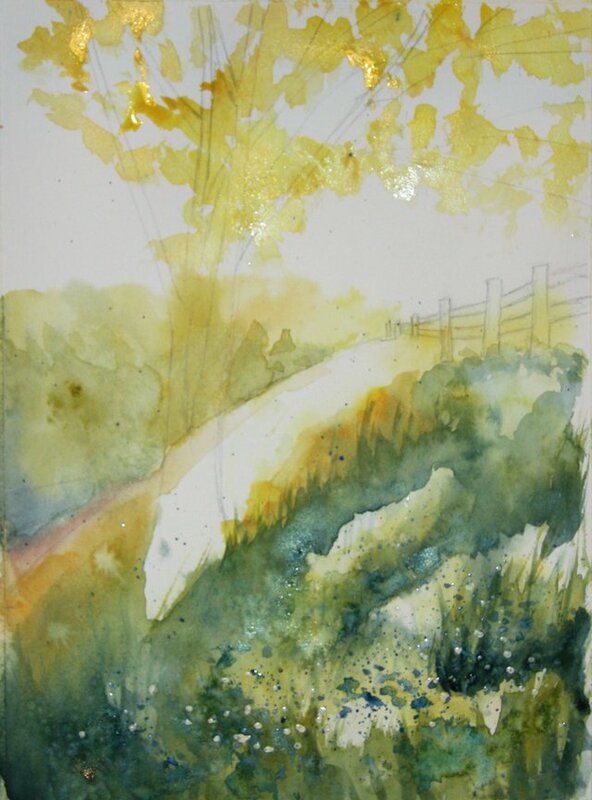 You're right about watercolor-warm colors and lightness...as well as the feeling of nature. I'm attracted to that, too. I think that watercolor will remain my hobby when I improve my skills in digital painting. I find it very charming that you made this picture again in digital ^_^. I think it already looks promising, though if it's against your watercolour art, it can not compare yet. I like the peaceful feeling of the colours, the green and yellow are soothing to my eyes. I think that the stage has come when I need to train more digital painting. Especially now I have a tablet. I like watercolor and I regret that I trained only six months....but I do not know how to make money on my watercolor paintings and Chinese painting (I'm talking about real life). Digital painting is more promising and I want it to grow from a hobby to a profession. Ohh! Good luck with making it into a profession. I think it will be a lot of hard work and quite some degree of selling your skill, but I feel you can do it. I am too noncommittal about art to make it my profession, but I respect anyone who is trying it out :). Love the variations of green and yellow that makes it comes alive ! Great that you made the digital example, too. It's nice to compare. I like the watercolor. Well, both, of course, but the watercolor more :) Effort pays off. Lovely! I'd be missing the green in your shoes. I know I do during our winter. I really like both pictures. It's hard to pick one from the other. I guess the digital pic is perfect, with no errors. Maybe a little too perfect. What a lovely painting on such a cold day here. I love it. 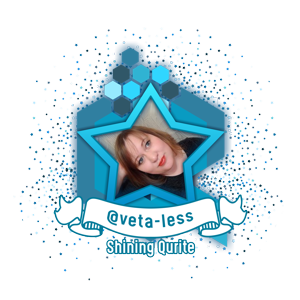 Nicely done @veta-less. I haven't really ventured into watercolors, that's next lol. 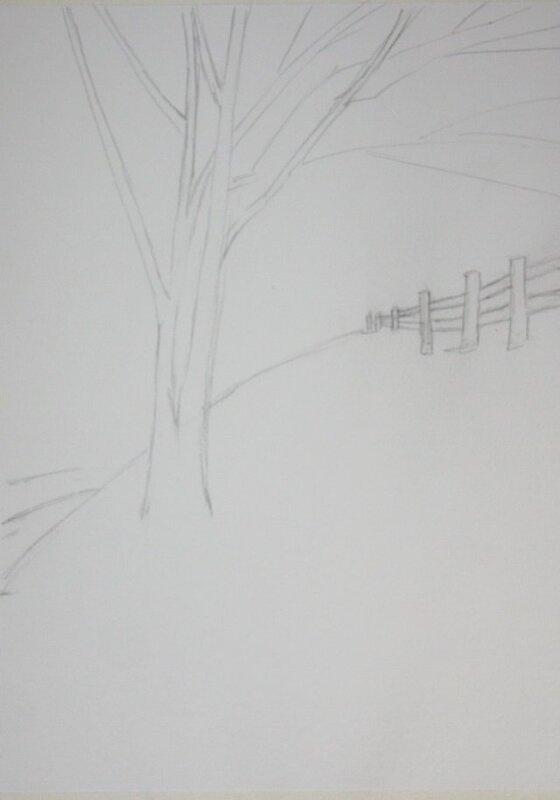 I like how you can sketch out your trees a bit. I can only see where the branches take me. The one picture gives the look of gold leaf was put on some of the leaves of the tree, but its just the light reflecting the wet yellow paint lol.